Well we had our final selections meeting at Robina yesterday afternoon. We were at Robina Town Centre picking up some lunch just prior to our meeting. So we were very shocked to hear about the shooting that occurred there. Very glad we had left before that happened! The final selections meeting consisted mostly of filling out paperwork since we had already made the majority of decisions at the previous meeting. We made a few minor changes including changing the colour of the down pipes to match the brick. We are also getting frosted glass in the front door, and double mirrors on all of the wardrobes in the spare bedrooms. Very happy with those changes, and so glad we asked about the mirrors in the bedrooms. It should be around $25 per mirrored door, at that price it’s much better than buying individual free standing mirrors later. We are also signing up to a new service offered by Clipsal, where we will sit down and do our electrical plan and get a fairly accurate quote. We have been trying to get a quote from the electrician for the past month, so this will be very helpful! We are still waiting on Council. We’ve had to provide additional information about our bushfire management plan and our external colours. We are still extremely nervous about this part of the process. Fingers crossed everything goes through smoothly. Also, Daniel has been updating the land page with a few things that have happened with the block, for those who are interested. So, we are getting the wall! Turns out that it is rather affordable and is being drawn up straight away. The measurements have worked out well and we think it will fit perfectly into our bedroom. It seems like it was meant to be. Especially that it will still sit well with our bay window. It definitely fixes the worries I had about the length of the bedroom. Can’t wait to start turning it into a feature wall. We also need to pick out some pendant lights which will hang down on both sides of the bed instead of having lamps. Meanwhile, we are still waiting on council approval. We’ve been working on maintaining the block a lot more than usual. Over the Summer/Christmas period we were so busy every weekend with house planning that it got a little bit out of control. We ended up getting a guy to come and mow/brush cut. Now that we have more time on our hands, we are getting back into it. We’ve been mowing, brush-cutting, weeding along the fence line and killing as many weeds as we can. It will be SO much easier when we actually live out there and can just pop outside to do some gardening rather than having to drive out there and take everything with us. Really looking forward to our tree change, fingers crossed. Today we are off to check out paint colours now that the world has started turning again and Bunnings is open. We’ve had a lovely few days hiking with family, going to the movies, and obsessing over the house like usual. It will be nice one day when more of our conversations revolve around something other than the house again. We are all set to look at the Lexicon colours, but I’m not sold on any in particular just yet. We shall see. We’ll also wait to hear back about this bedroom wall idea to see if it’s viable. That Daniel, he’s an ideas man. As long as it’s affordable and we can make it work, then I’m in. It’s definitely a huge bedroom, particularly in length-which I have been a bit uncomfortable about. So this might be a good solution. Meanwhile my friend Fiona is about 2 months ahead on their build and I’m loving the pictures on Facebook of their frame going up. Very exciting to think that if all goes to plan that will be us soon! Here are our selections so far! They look a little drab in photo form, but we are very happy that we have stuck with our instincts. It’s very much a grey and white theme, which I love. My favourite combinations are grey, white and yellow, or grey, white and red. So I guess you can tell what colour scheme all of our accessories, appliances and decor might be! 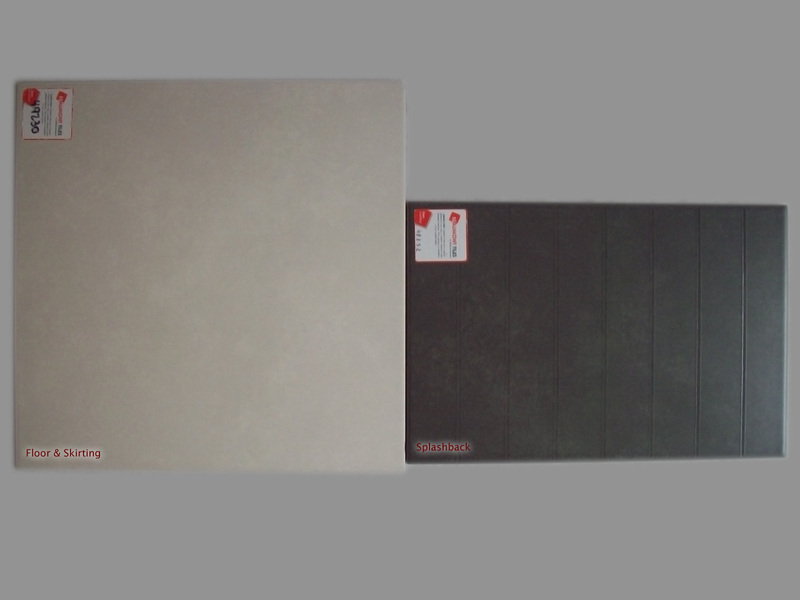 We’ve chosen Slate Grey (AKA Colorbond Woodland Grey) for our tanks. The main reason is that due to the shape of our block, the tanks will be very visible. Any light or bright colours will draw a lot of attention as they reflect light. So we’ve chosen a dark colour in the hope that we can put a garden around them and blend them in a bit more than if they were bright green for example. We considered matching them to the house, but they won’t actually be right up against the house, so there’s not much point in trying to match. Daniel and I have had a fun filled few days. We both had a 3 day week which was lovely, but also stressful trying to get everything done at work in time. On Thursday afternoon we went to our selections meeting at Robina with Coral Homes. We schlepped all of our tiles, bricks and paperwork in with us to help make the process easier. We weren’t sure what to expect and personally I felt under prepared. 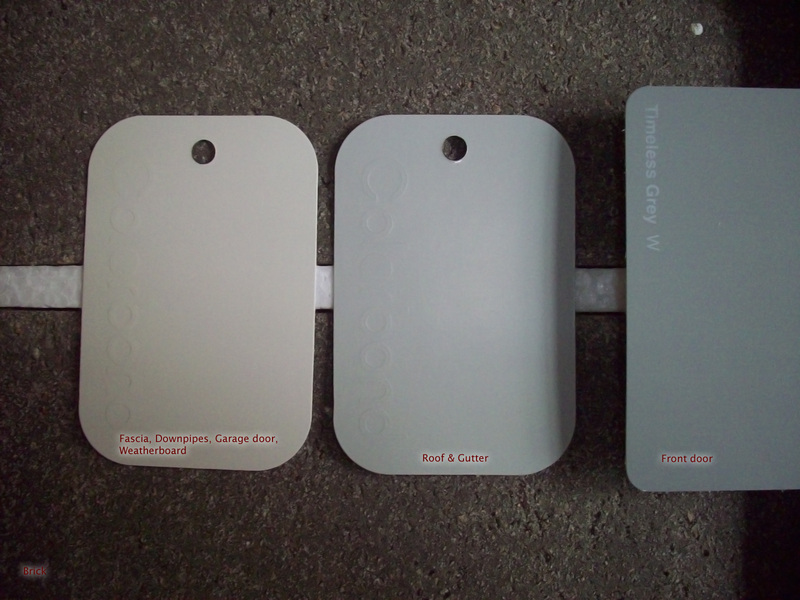 We had a few ideas, mostly relating to the garage door and weatherboard colours, and our kitchen colours. Once we got there, things were underway fairly quickly. We met with our consultant Rachel who was very helpful and made the process quite straightforward and informative. The venue is just like a giant showroom full of samples. Pretty much, we went through everything marking it off in order on our paperwork as we went. We started with the outside of the house and worked our way to the inside. Not too many issues which was good. We were initially disappointed to find that our plan for having a dark charcoal front door was not meant to be. Our consultant informed us that dark based colours are known to warp the door within 2 years due to it drawing heat. 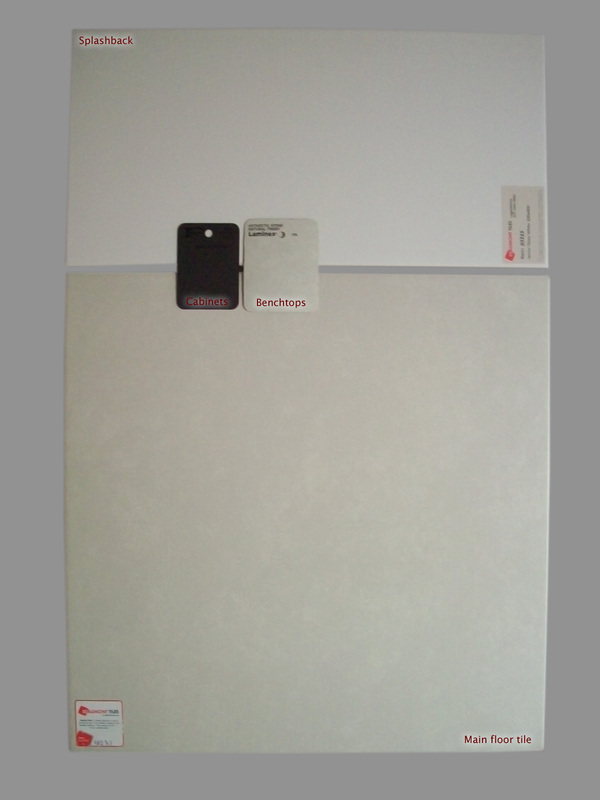 However, we found a white based grey so that it wasn’t too far off what we were looking for. We still need to decide on an internal paint colour and kitchen cupboard handles. The only thing we are paying extra for so far is frosted glass in the front door for privacy (very important for pretending you aren’t home). Everything went fairly well and I realised we were fairly well prepared after all. We are booked in for our final meeting in a few weeks. Hopefully things will continue to go smoothly. The main concern at the moment is about Council approval, then we might finally be able to breathe easy. Here is a video showcasing what Coral Homes customers can expect from a colour selections and finishes meeting. Daniel and I seem to be able to stare at our floor plan for hours. I am absolutely in love with it. I love trying to imagine what it will look like in person. I’m constantly on Pinterest looking for ideas on how to decorate and planning different areas of the house. (Pinterest is one of my other obsessions in addition to the house). We have added a bay window to the master bedroom, something I’ve always wanted! Growing up, my parents had a bay window in their room and I loved it. Our puppy loved sleeping on the bay window seat and being able to look out and growl at the birds in the garden. Theirs had an amazing little garden underneath the windowsill. I really hope my Mum will help us to make gardens as beautiful as hers were! My parents now live on a boat, so hopefully Mum might enjoy directing some gardening escapades. I’m also excited about the fact that our bathroom window is situated very close to our gully. When it rains heavily, you can hear the water rushing through the gully for days/weeks afterward. I can just imagine having a bath and being able to listen to those sounds. It should be amazing! We really love the open feel of the kitchen, dining and family area. I’m currently obsessing over kitchen colours. We have already picked out three pendant lights that will hang over the island in the kitchen. Just what I have always wanted! It’s hard to see on the plans, but there is also a cut out between the family and activity room where we will install plantation shutters at some point. The study and media is pretty much the main thing that we needed in any house we chose. Eventually we will have some type of folding door installed, turning the space into two separate areas when the door is closed. I’m imagining some kind of amazing print on the back of the folding door which only becomes apparent when it is closed. Initially we won’t have the door and it will just be one open space. Coral didn’t offer the exact type of doors we were looking for. It seemed easier to just get them to put a square set in the spot where we want a door and get it installed later. Pretty big house for two people! I guess we are just preparing for the house we will need in the future. We chose our bricks several months ago, but didn’t get any samples to take home. With our first colour selections meeting coming up next Thursday, we thought we should hurry up and get ourselves a sample brick to match the weatherboard with. I was struggling to work out how I was going to get there during business hours to pick one up. I also have a busy day booked for tomorrow and knew I wouldn’t be able to make it. I called the Lawnton Boral Bricks office and they were very helpful. They were nice enough to courier a sample to us free of charge! I’m really pleased with how they look in the flesh. It’s been a while since I’ve seen them and I had started to have a completely different image in my head. Can’t wait to build a house out of these babies! With the relaxed feeling of a holiday under our belts and another week away from work, we went back to Coral Homes armed with plenty of research and ideas about what we would like to do. We spent days doing nothing but scouring over the single story designs that Coral had on offer. Something had us coming back to the Marcoola every time. Even Julia our sales consultant suggested the Marcoola without us mentioning our interest. It was the right house for the block, and still had everything we had originally liked about the two story design. Having already gone through the process of getting soil tests and assessments done, we were further ahead in the process this time around. So Coral were able to use a lot of the same details to take us through to the next step with the Marcoola. What we have ended up with is a slightly modified Marcoola 30. It’s going to be a beautiful 4 bedroom home. There will be a bay window to the main bedroom at the front, something we have always wanted! Our media room will have a divider so that it becomes an office and media room in one. The idea being that Daniel will be able to use the computer (for work and other such purposes) while still feeling like he is part of the action in the media room. Then we can close the door if it needs to be separated. This has always been our setup in the places we have lived, so it’s been very important for us to be able to have the office able to open up into the media room. I think the main thing we love about the design is how open it feels. 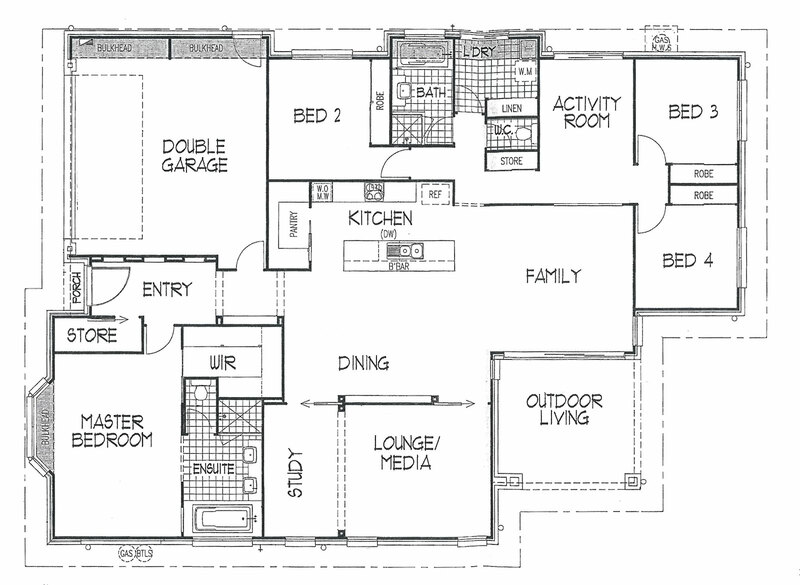 It has all of the little nooks and specific rooms that we want, while the rest feels very open. Although it’s a modern house, we have managed to get some of the feel we would have wanted in a colonial home. We still have some weatherboard features, a bay window, a tin roof (Colorbond), nice bricks and a simple design. Here’s a mock up Daniel made. Cute huh? Let’s hope our real house is just as cute as this cartoon one! The last few months have been very busy. It feels like we have spent the majority of our weekends either at the Coral Display at Northlakes signing paperwork, at the block, or off looking at things for the house. 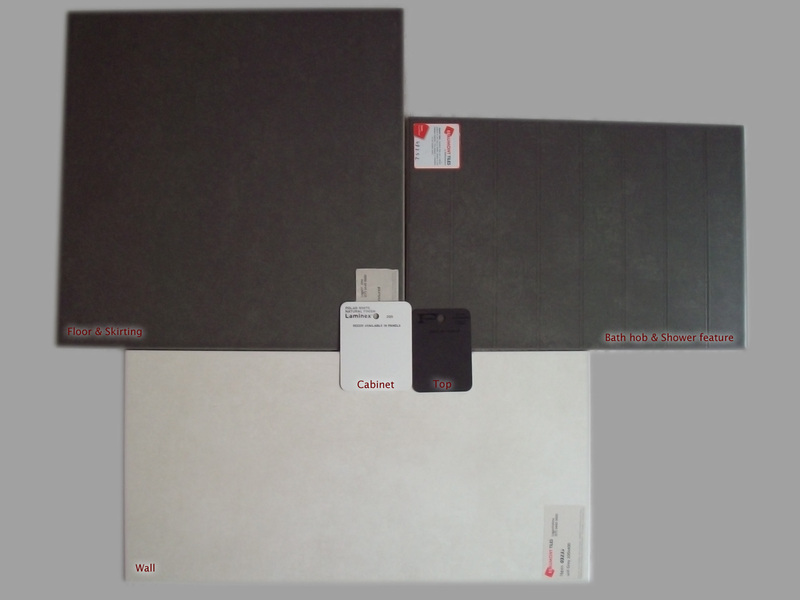 We have selected our bricks and tiles and we are all set to go to our two colour section meetings in April. Hopefully everything will go to plan from here onward! We have been hoping for that all along, but seem to have still stumbled across a lot of issues, so fingers crossed. It now feels so close! It’s been suggested by our Sales Consultant that we could be in our new home by August this year. I’m thinking more like September though considering how long it has taken to get the contract sorted. I don’t really mind if anyone reads this blog. For the most part, I’m hoping this will be a good way to record the progress of our house being built, but I also hope it will be interesting for those who are, well, interested. Welcome to our blog Kookaburras and Snakes. Alluding to the fact that this is exactly what you will find when you visit us once our new house is built! In July 2010 my partner Daniel and I (Lauren) became the proud new owners of a block of land in a rural area near Brisbane. We may be young, but this is our dream, and we fell in love with this beautiful piece of land the moment we found it. Daniel is a city boy and knew the area fairly well already. Having grown up in a rural part of Queensland, it felt right for me to move somewhere which would allow us to have that relaxed feel when we come home, while still being close enough to work in the city. Being young, inexperienced and eager, we assumed the building process would be difficult. However, we never imagined it would take us quite so long to get things organised and ‘get this show on the road’. It feels as if there have been many hurdles. During the 2011 Brisbane floods, all 100 metres of the shared driveway to our piece of paradise was completely destroyed. Many, many, many thousands of dollars later we were further behind than ever and a little bit shaken up. It then took us much longer than we thought it would to sell our apartment. In April 2011 we finally sold our apartment and moved into a cute little townhouse we had rented to see us out until we are able to move into a completed house. It wasn’t until about August 2011 when we were finally able to feel like things had fallen into place enough to get serious about the building process. Prior to that we had gone back and forth between several builders. Initially we were hoping to have a colonial style home. For a while we thought we were set on having a two story home on stumps. The plan was to live in the upstairs part and not build in the bottom part until later. The longer we took to look at builders, the more torn we became. At that stage we were still wanting a two story home as we felt this would make the best use of the small area we had to build on. Although our property is acreage, the majority of the land is mountainous and there is really only one small area where the ground is level and suitable for building on. Eventually my brother Dale suggested Coral Homes. I was skeptical at first and felt we had been disappointed so many times before with the reality of how much our dream would cost. But we haven’t looked back since! Initially, even when we went to Coral, we were still wanting a two story home. We had our hearts set on the Barbados. To be honest, it was huge, and entirely beyond what we could ever need between two of us and any potential future kidlets. We went through the whole process and received our tender back. When we got the price back (even though the price wasn’t too much of a surprise), panic set in. Somehow, seeing it on paper put everything into perspective. What the hell were we doing? Apart from the fact that it was HUGE, we had somehow let our budget expand as our desires changed rather than just sticking to what we could afford. Realising the expense of the monthly mortgage payments would mean there would not be much left for saving, holidays, and really, ANYTHING, put it all into perspective. Although we could have managed, we would not have been able to live the relaxed lifestyle that this land is supposed to offer. Within an hour we had made the decision to pull out on the two story home. One phone call later to Julia, our sales consultant at Coral, we had cancelled and informed her that we had decided we needed to go with a one story home. Julia was amazing! Her response was fantastic. We went from feeling so awful, and that we had wasted their time, to feeling an overwhelming sense of relief and excitement. It felt as if we had dodged a bullet. The very next day we went on a holiday to Stradbroke Island. It was just the perfect timing to give us the space to breathe away from our jobs to realise that we had made the best decision possible for our future. Realising that we would have barely been able to afford a simple holiday to Stradbroke definitely made us see sense too! We have so much we want to do in the next few years, and with life in general, now this means we will actually be able to do those things without feeling completely tied down.